While discussing their new joint-business venture allowing patrons to bake their own pizza, Kramer and Poppie have an intense debate about whether it is a pizza when it “comes out of the oven” or when “you put your fists in the dough.” Does Kramer have a right to always make determinations about how he wants to bake his own pizza? Can Poppie place restrictions on how customers want to bake their own pies? The general right to make decisions about how to bake a personal pizza is guaranteed by the United States Constitution. When analyzing whether a restriction placed on baking a pizza is constitutionally permissible, the courts will look at three factors: (1) whether the restriction places an undue burden on the baker before the pizza is viable; (2) whether the restriction includes a health-exemption for the baker after the pizza is viable; (3) and that the pizza store owner has an interest in protecting both the baker and the pizza. It is debatable at exactly what point in the baking process pizza-viability occurs, but it is generally considered to be a little less than 2/3 of the total time from the moment the fist is first put into the dough. While we could debate the ethical questions of whether a pizza is a pizza at the moment “you put your fists into the dough” or when “it comes out of the oven,” the more legal and scientific answer of a little less than 2/3 of the total baking process should guide our analysis. From a few quick phone calls to local pizza stores it seems like it takes about 15-17 minutes from the moment a fist first goes into the dough until it comes out of the oven. This means that Poppie, as the owner of the store and head-chef, can place any restrictions on baking a pizza after about 10 minutes. But he can only regulate how someone bakes a pizza before 10 minutes so long as the rules do not impose an “undue burden” on the baker. Courts have upheld a number of pizza-baking related restrictions, saying that these do not impose an undue burden. For example, a pizza store could: require a baker to have informed consent, i.e. listen to a pizza-chef expert explain the pros and cons of pizza-baking styles, and then wait 24 hours before pursuing a specific baking technique; or mandate that there is parental consent or independent judicial approval for an underage baker to stop the baking process. A pizza store could also prevent a baker from destroying a pizza by prematurely removing it from the oven, instead of terminating it while it is still in the oven, even before the pizza is viable. But a baker could not be required to consult with a co-baker about personal choices related to what she wants to do with her own pie. So what gives Poppie the right to tell Kramer, or anyone else, how he can make a pizza? Since the actions take place in Poppie’s restaurant, he has a right to protect the interests of all the pizzas that are going to be created within its walls. As we discussed above, this interest can be absolute after the pizza is viable but must not impose an undue burden on the individual pizza baker within the first 10 minutes of the baking process. Can Poppie demand that Kramer stop putting cucumbers on a pizza? Do the people have an unlimited right to put any topping they want on a pizza? Do they have full autonomy to determine how they should make their own pie? Kramer’s actions occur in the earliest stages of the pizza-baking process, so any restrictions enacted to protect the pizza must not also place an undue burden on Kramer. A pizza with cucumbers on it will likely taste terrible, so there appears to be at least some interest in ensuring that the validity of the pizza is protected. But, at the same time, the simple fact that it might taste terrible does not mean it will not still be a pizza: it will still have sauce, cheese, and a vegetable topping. Poppie could have required that Kramer undergo a counseling session with a pizza professional on whether he really wanted to put cucumbers on the pizza and then also require Kramer to wait up to 24 hours before baking a pizza topped with cucumbers, but it is unlikely that Poppie could totally prevent Kramer from doing so. However, had Kramer wanted to add new toppings to his pizza after 10 minutes, once the pizza became viable, Poppie could have likely stopped him. Kramer’s right to make determinations about how to bake his own personal pie is protected by the Constitution, with some restrictions. 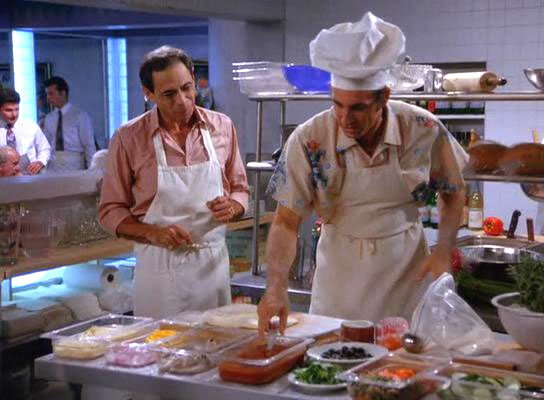 While Kramer’s taste in pizza toppings may be bizarre, Poppie cannot prevent him from adding cucumbers to a pizza this early in the baking process.